Michael Ball performs live in the Radio 2 Piano Room and Sara Bareilles picks the Tracks of My Years. Plus Ken has another round of the PopMaster music quiz. 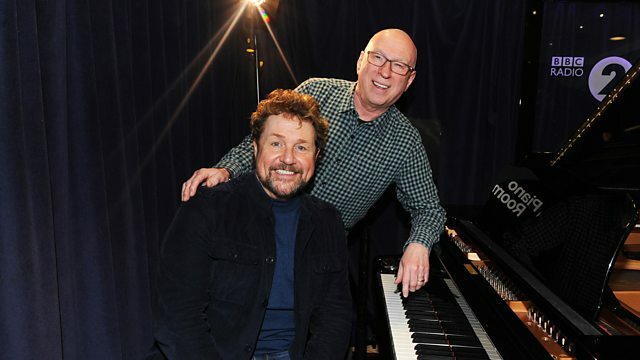 Michael Ball performs live in the Radio 2 Piano Room with music from his new album Coming Home To You. It's Michael's first solo album in over four years and features some original tracks Michael has written, alongside covers from Elvis Presley, Dolly Parton and Cliff Richard. It follows the phenomenal success of Michael’s last two albums with Alfie Boe, which saw two No.1 albums, two Classic Brit Awards and over a million album sales. Michael is a double Olivier Award winner, multi-platinum recording artist, top-selling live concert performer and a well known TV and radio presenter. Sara Bareilles, the American singer-songwriter, actress and author picks the Tracks of My Years with songs from Elton John and Britney Spears. Sara, who is a six time Grammy Award nominee is about to release her first studio album since 2013, Amidst The Chaos alongside the lead single Fire. Sara made her debut with the album Little Voice in 2007, which reached number one in 22 countries around the world. Since then, she has gone on to release a New York Times best-selling book, Sounds Like Me – My Life (so far) in Song, and numerous studio albums including, What’s Inside: Songs from Waitress. Sara wrote the music and lyrics for the hit Broadway musical Waitress, which has now opened in London's West End. Now That's What I Call No.1's (Various Artists).